Abstract : Real-world reflectance data can be used to improve the realism of synthesized images, albeit with many challenges: memory footprints can be large, profiles are limited to a finite (usually small) set of materials and rendering with measured data can be costly. Since the observation space (number of reflectance measurements) is usually much larger than the underlying space of real-world reflectance profiles, a typical optimisation strategy identifies principal components in the data to directly render from compressed representations of the measurements. We directly learn an underlying low-dimensional non-linear reflectance manifold amenable to rapid exploration and rendering of the space of real-world materials. We show that interpolated materials can be expressed as linear combinations of the measured data, despite lying on a non-linear manifold. This allows us to efficiently interpolate, extrapolate and render directly from the manifold. 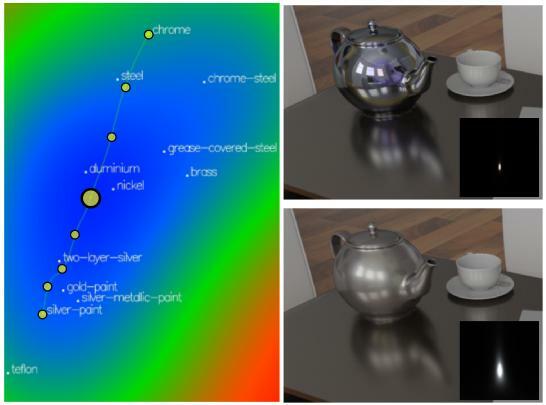 We apply a Gaussian process latent variable model to represent the reflectance manifold, demonstrating its utility in the context of high-performance and realistic rendering with materials that are interpolations of acquired BRDFs (from the popular MERL dataset).